There are a lot of options to choose from if you want an outdoor basketball court but a portable hoop system is the default choice for hoops when one thinks of installing one on their home. Their mobility makes them a safe choice if you would be moving it from one place to another (eg. from the driveway to inside the garage during winter) or even from one home to another. There moveability also makes them versatile as you could choose to install them outdoors or inside, making an indoor basketball court. However, with the number of portable basketball hoops in the market, choosing the right portable basketball court can be a daunting task. You can’t just randomly choose one and hope for the best as these systems cost quite a bit of money. In this comparison, we take a look at the best portable hoops available, and rank each one of them in different criterias. 1. Lifetime 1479 – The Lifetime 1479 is the easiest to install among this bunch. The instructions are easy and the whole process can be finished in a couple of hours. This ranks among the easiest basketball hoop installation ever. 2. Spalding NBA Hercules – Second to the Lifetime 1470, is Spalding’s Hercules. The installation can be finished in a few hours and the instructions are straightforward. Another easy assembly. 3. Lifetime 1558 52 Inch Portable Basketball Hoop System – Coming in at third is Lifetime’s 52 Inch Portable Hoop. Despite being manufactured b the same company, the degree of difficulty in the assembly of this hoop is different from the 1479. It as also fairly easy to install but also requires a few tools to get the job done. 4. Spalding NBA The Beast – The Beast is also a beast to install. While the manual that comes with it is clear and concise, it’s in the actual assembly that’s a bit difficult. Almost all of the parts are heavy, especially the massive backboard, making the installation time longer than usual. 5. Lifetime 90061 – Compared to the other two Lifetime products in here, tis is quite a bear to install. Some of te directions are quite confusing and that worse part is that there are some parts that will never come of if you manage to install them incorrectly. Utmost care and focus is required when assembling this hoop. 6. SKLZ Portable Basketball System with 50-Inch Backboard – Installation for this will be a lot of work coupled with a few head scratches in between. The instructions are quite confusing and there are some parts that are mislabeled. Before starting installation, you better check first all of your parts if they are complete. 1. Lifetime 1558 52 Inch Portable Basketball Hoop System – Almost every portable hoop is an adjustable basketball goal, but this one’s height adjustment mechanism is in a class of its own. It is very easy thanks to Lifetime’s Action Grip Height Adjustment. Just squeeze the handle and the adjustment can be done with almost no effort at all. Even children can do it with one hand. 2. SKLZ Portable Basketball System with 50-Inch Backboard – Similar to Lifetime’s Action Grip, SKLZ’ Quick-release pin makes height adjustment very effortless. Though not as easy as Action Grip since it cannot be performed with one hand. 3. 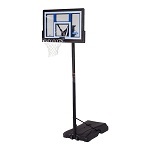 Spalding NBA Hercules Portable Basketball System – 50 Acrylic Backboard – The Exacta-Lift System by Spalding is the mechanism used by this goal. It’s very easy to perform the adjustment by pulling a lever. 4. Spalding NBA “The Beast” Portable Basketball System – 60″ Glass Backboard – Another hoop with an easy adjustment mechanism, The Beast uses the ScrewJack Lift System which makes use of a handle that you could pivot in order to adjust the height. The only drawback here is that this mechanism needs some maintenance, meaning you would have to lubricate it periodically in order for it to function properly. 5. Lifetime 90061 Portable Basketball System, 52 Inch Shatterproof Backboard – This hoop system uses the Front Adjust by Lifetime. There are two handles that you have to hold and while gripping the triggers on it, you could adjust the height. Easy but takes some effort. 6. Lifetime 1479 Courtside Height Adjustable Portable Basketball System, 48 Inch Shatterproof Backboard – This is the hardest to adjust of all the hoops that we are reviewing. It’s not that it’s so hard, but it requires a broom stick or any long object to adjust the height. Compared to the others, this is the most difficult of course since they do not need any foreign objects when adjusting their heights. 1. Lifetime 1479 Courtside Height Adjustable Portable Basketball System, 48 Inch Shatterproof Backboard – The Life time 1479 is the easiest to move in this bunch. You still need 2 people to move it, but it makes it almost effortless due to its lightness, especially if you remove the base contents. 2. Spalding NBA “The Beast” Portable Basketball System – 60″ Glass Backboard – Surprisingly, The Beast is one of the more easier to move portables despite the fact that it is the biggest and heaviest. This is due to its four wheels, which makes it very easy to pull or push in a flat surface. 3. Lifetime 52 Inch Portable Basketball Hoop System – The Lifetime 52 inch is the typical portable where you have to remove the base contents to move it smoothly. It’s not easy, but it’s also not that difficult. 4. Spalding NBA Hercules Portable Basketball System – 50 Acrylic Backboard – The Hercules is on the difficult side when it comes to moveability. With its 39 gallon base coupled with only 2 wheels, expect to put out some effort when attempting to move this hoop. 5. SKLZ Portable Basketball System with 50-Inch Backboard – The SKLZ Portable is hard to move due to its massive size and weight. Removing the contents of the base is really recommended, or at the very least have someone help you move this. 6. Lifetime 90061 Portable Basketball System, 52 Inch Shatterproof Backboard – The Lifetime 90061 is the most difficult to move in our line-up. It’s not the biggest but due to the materials used on the parts, the weight of this thing makes it very hard to move around. Removing the base contents is required, not just recommended, if you want to move this goal. One or Two more people are recommended to help out. 1. Spalding NBA “The Beast” Portable Basketball System – 60″ Glass Backboard – As expected, The beast comes out on top when it comes to build quality. One look at the goal and you’ll know that only the best materials were used in manufacturing it. Everything feels solid and sturdy. The backboard is made of tempered glass, which is the closes you can get to professional levels. 2. SKLZ Portable Basketball System with 50-Inch Backboard – Coming in at second place is the SKLZ Portable 50 inch hoop. The build quality is excellent, from the backboard all the way to the base. The backboard is made of polycarbonate, which is a notch below tempered glass when it comes to playing experience. 3. Spalding NBA Hercules Portable Basketball System – 50 Acrylic Backboard – Even though this goals backboard is made of acrylic, which is inferior compared to polycarbonate and tempered glass, it still manages to snag 3rd place as the other materials make up for the so-so board. The poles are well made and powder coated and the base is durable as well. 4. Lifetime 90061 Portable Basketball System, 52 Inch Shatterproof Backboard – The Lifetime 90061’s build quality is quite nice, but it’s still inferior compared to the first three from the list. The backboard is made of polyethylene which is actually inferior to polycarbonate, but does the job quite well are there is minimal shaking when taking shots. The poles are protected by an all weather finish. 5. Lifetime 1479 Courtside Height Adjustable Portable Basketball System, 48 Inch Shatterproof Backboard – The Lifetime 1479 is a good quality built hoop system. The backboard is made from polycarbonate and the poles are protected via powder coating. However there is noticeable movement when shooting the ball which indicates that the build quality of the frame/backboard isn’t up to par compared to other hoops. 6. Lifetime 52 Inch Portable Basketball Hoop System – Rounding out the list is the Lifetime 1558. The backboard is made of polycarbonate and the poles are rust protected which makes this a durable goal on paper and suggests that the build quality is top notch. However there is noticeable wobbling and shaking when shooting especially on hard shots to the backboard. While its a nice hoop and definitely will last years, the shaking takes away from the experience and indicates a not so high quality build. There is no question that Spalding’s The Beast is the best of the bunch here. The build quality and the portability is absolutely astonishing making it the best basketball hoop available in the portable class. However, it is without a doubt also the most expensive, by far. SKLZ’s Portable 50 inch is a nice alternative, offering a great portable system for about half the price. For the budget conscious, you cannot go wrong with the Spalding Hercules or the Lifetime 90061, both of whom are excellently built systems while being budget friendly at the same time.